Look at the cuteness you can hatch this Easter. Gather a basketful of oohs and aahs with these sweet little bird nests cradling miniature Easter egg candies. Bonus: They're so easy to make, even kids can help. Group several nests on a tray for a charming Easter brunch centerpiece, or use them to mark individual place settings. For Easter baskets and take-home party favors, slip them into individual clear food bags and tie up with pastel ribbons. 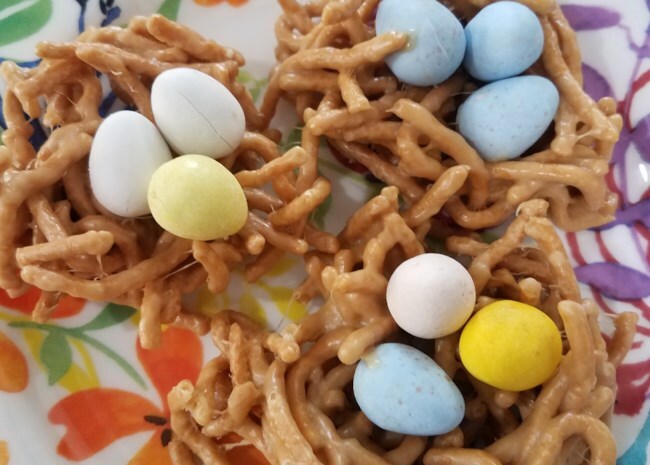 Melted marshmallows, peanut butter, and store-bought crispy chow mein noodles are shaped into tiny nests that look like they're really made of twigs. You can shape the nests free-form, as in this recipe, or you can press the mixture into oiled cupcake pans for more uniform sizes. 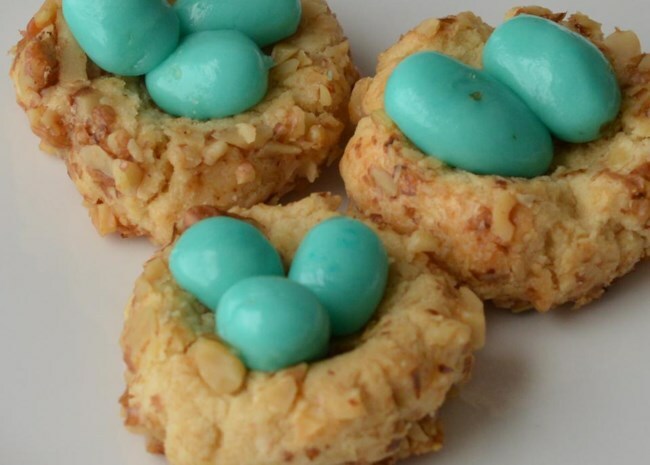 Once they cool and firm up, fill them with mini egg candies or jelly beans. Homemade cookie dough gets rolled in chopped walnuts and baked to form tasty butter cookie nests. The recipe bumps up the skill level if you want to make fondant robin's eggs, or you can keep it easy by garnishing with ready-made pastel or speckled candy eggs. Butter cookie dough rolled in tinted or untinted coconut flakes are baked with candies pressed into the middle, or you could make an indentation in the cookies and add the candies afterwards. If you use untinted coconut, it will toast lightly while it bakes. As written, decorating this cupcake recipe is pretty straightforward. 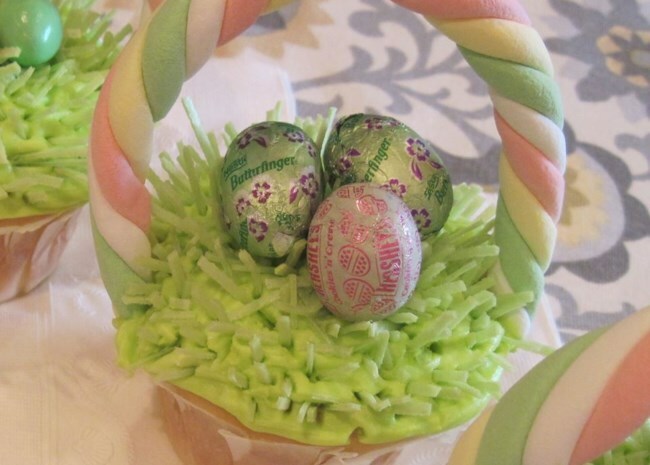 But if you want to decorate the top of the cupcake as shown, you could press tinted fondant through a garlic press to make grass, or stick short strands of edible Easter grass into green frosting. Twist colored strands of fondant to make a basket handle, or check a candy specialty store for pastel licorice to make easier basket handles. Learn how to make all-natural Easter egg dyes using everyday cooking ingredients, and get ideas for decorating Easter eggs. Ready for the advanced Easter egg decorating course? See how to make pysanky — Ukrainian-style Easter eggs. Get Easter party ideas and plan a scrumptious Easter brunch. Hop through our entire collection of top-rated Easter recipes.